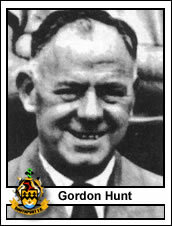 Southport Football Club’s period of membership of the Football League spanned 57 years; for one man to have worked for a football club-anq frequently a struggling club at that-over no fewer than 53 of those years is quite exceptional; but few men are as dedicated and loyal as was Charles Gordon Hunt. To chart his career is to tell the story of Southport itself as a Football League Club. Suffice it to say that he was recruited as a junior clerk to the then Secretary Edwin Clayton (June 1923), was appointed Assistant Secretary under Bert Peiham (July 1931) and succeeded Jimmy Commins to become the youngest secretary in the Football League (May 1936). He then held the post of Secretary-Manager from 1937 to 1958, excluding only the war years when he served in the RAF. Latterly he was one of the most respected and knowledgeable secretaries in the game up to his retirement in 1976. Within two years Southport were out of the Football League . . . This brief outline cannot do justice to the role he fulfilled. The tight control he constantly exerted over the club’s meagre finances was in itself a major contributory factor to its continued existence. Stories of’his economies are legion; not just to conserve electricity would he forgo switching on his office light-his parsimony also misled visiting creditors into believing there was no-one inside to harangue. Players of all ages bear testimony to the way that Gordon would retain them for the following season, but on reduced terms. The lucky ones might, after a lengthy discussion, get him to concede reinstatement to their “previous season’s wage and would emerge triumphant, feeling they had achieved a substantial bonus! Without any previous professional experience Gordon was often left to manage all aspects of the club’s affairs; he it was who scoured the free transfer lists at the end of each season and assembled a squad of players for the trainer to mould into a team-occasionally investing as much as £100 to secure a player of the calibre of, for example, Joe Patrick. Yet through all this he remained a-very private person, seldom ventur~ ing from the seclusion of his office to share in any of the rewards of the job. Shy and unassuming he remained a bachelor, a Haig Avenue resident and a Southport fan right up to his death, still a‘regular, if discreet, attender at matches albeit ill health had made him a notable absentee from the club’s Centenary Reunion in 1981. On a personal note we will always be grateful ‘for the help and encouragement he gave us in our researches into the club’s history and in our quest to track down and interview old players, so many of whom. years later, would immediately enquire after him and recall his commit ment and devotion. Gordon died of a heart attack at the wheel of his car just last week, Southport Football Club must count themselves extremely fortunate to have enjoyed over so many years the services of a man as remarkable as Gordon Hunt. M. P. B. G, S. W.